These pictures are of various, not so well-known places around the center of Berlin, which in Berlin is known as Mitte (middle). These particular photos are not really part of a set, so I am just lumping them together under the title “Mitte”. 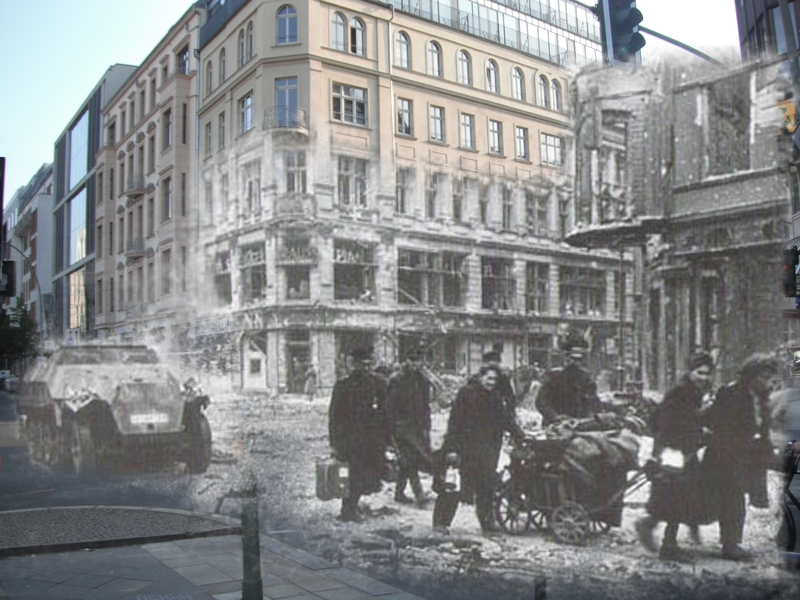 The first picture is of the corner of Friedrichstrasse and Rheinhardtsrasse. Friedrichstrasse is a main avenue in Berlin and the Friedrichstrasse Bahnhoff (train station) is one of Berlin’s more important stations. In this photo, which was probably taken after the Battle of Berlin, we can see some civilian refugees streaming past a German Sd.Kfz. or Sonderkraftfahrzeug (special purpose vehicle). This type of tank/truck hybrid could be considered an ancestor of the Humvee and could be referred to as a half-track but that was a term for the US versions of these. Regardless, the Sd.Kfz. came in so many different configurations that I wont even try to guess what the proper model is with any authority. But, well, this could be a Sd.Kfz. 251. 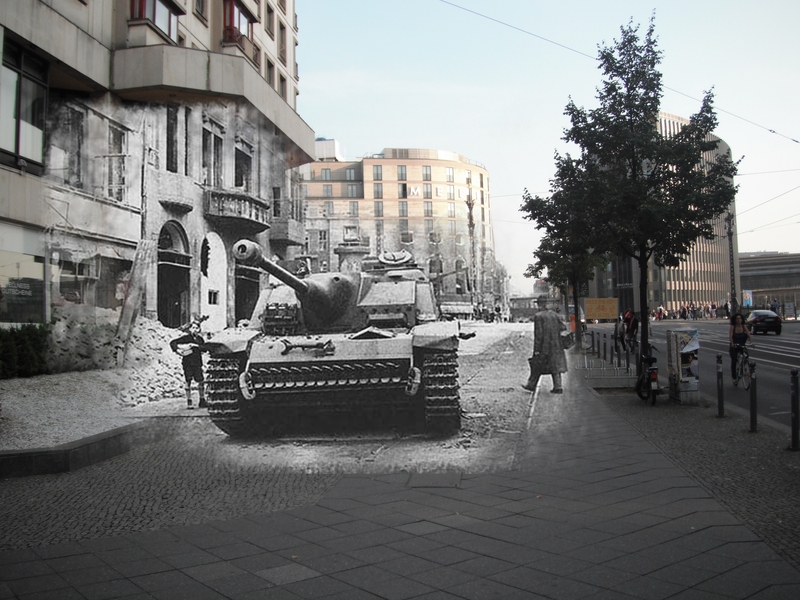 Again on Friedrichstrasse but closer to a bridge crossing the Spree this German tank destroyer assault gun was knocked. From the looks of the picture, this was taken some time after the Battle of Berlin as, at least to some extent, life seems to be getting back to normal. This particular vehicle is called a “Stug” Sturmgeschutz (literally: assault gun). Its designed to travel along with the infantry and serve as a close mobile artillery support by knocking out bunkers, defensive potions, vehicles and perhaps a light tank. Assault guns aren’t tanks, tanks have moving turrets, assault guns do not. Ill be truthful and admit I’ve never actually been to the Bode Museum. Apparently it is full of things that would actually interest me greatly. The museum is named after Wilhelm von Bode, perhaps considered a bit of a fraud in the art world. Regardless, I’d guess this picture shows damage received during the Bombing of Berlin, but it very well could have been taken after the Battle of Berlin. This was the Reichsbank and is located on Kurstrasse to the Eastern part of Berlin Mitte. Today this is the office of the Bundesbank, the German national bank, which was established after World War two, in 1957. This is actually a strange picture as it appears to be a picture of an American M4 Sherman tank. Therefore, either this tank was loaned to the Soviets during Lend Lease and fought its way to Berlin. Or, this actually is an American tank that appeared with the Americans who arrived after the Battle of Berlin. EDIT: Im not sure what I was thinking. That tank is surely not an M4 Sherman. I will go sit in the corner and think about what I’ve done. Coming back to museums,and its hard to not speak of museums when talking of Berlin, here we have a lone Red Army soldier walking past the ruins of the Neues Museum. The Neues Museum sits on Museum Island and is home to the 3,300 year old Bust of Nefertiti, which Ill have to admit, I still haven’t seen. The Neues Museum still has bullet holes in its facade and was so badly damaged during the Battle of Berlin that it was not reopened until 2009. 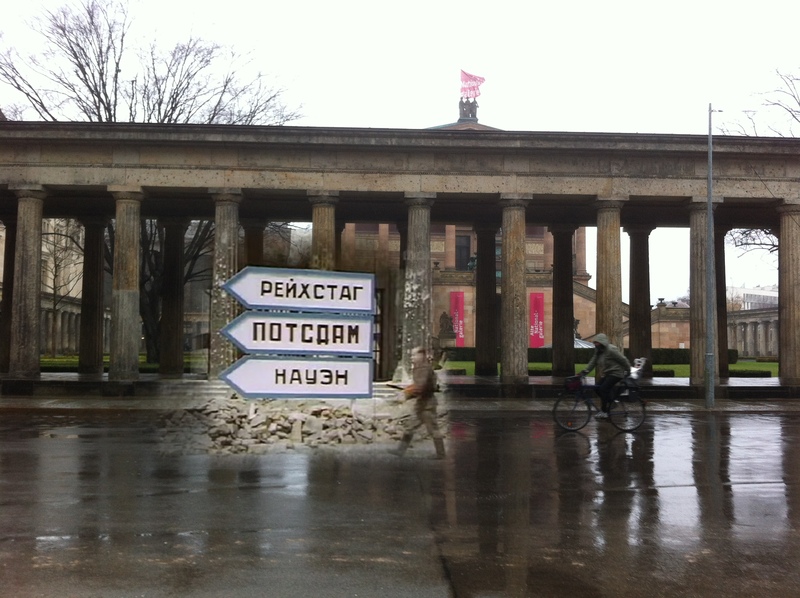 This photo was taken “way out west” at Charlottenburger Tor (yep, another one of those gates). Here we have six, Canadians, Tommys of the United Kingdom, standing on a statue of I have no idea who. To make it clear, the Soviets captured Berlin, but later the other Allied nations like the US, the UK, and France arrived to participate in the occupation. As I said, the gate is in Charlottenburg, the West, and I only went there to take this picture. Afterwards, I turned back to my home in the East and got under the covers. 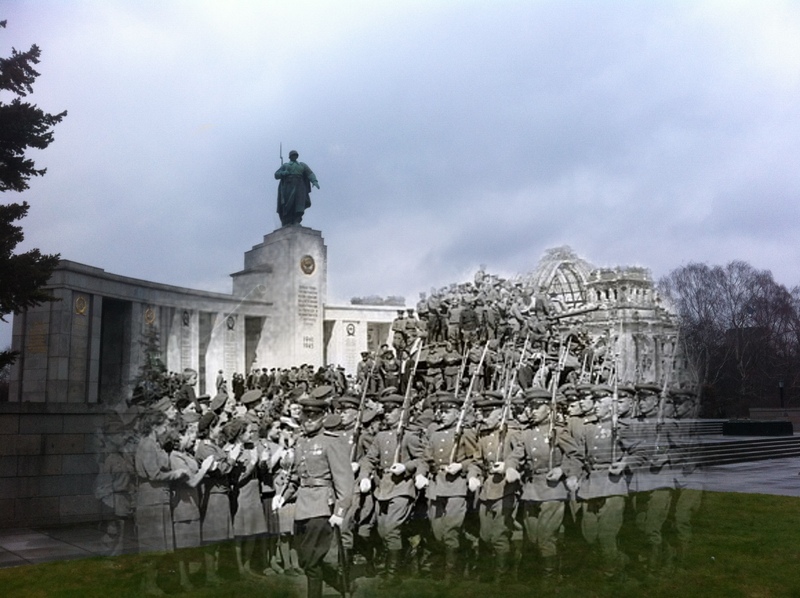 Clearly long after the Battle of Berlin, Soviet soldiers march past a memorial to fallen Red Army soldiers in Tiergarten. If I remember correctly, it was meant for the soldiers who died taking the Reichstag. 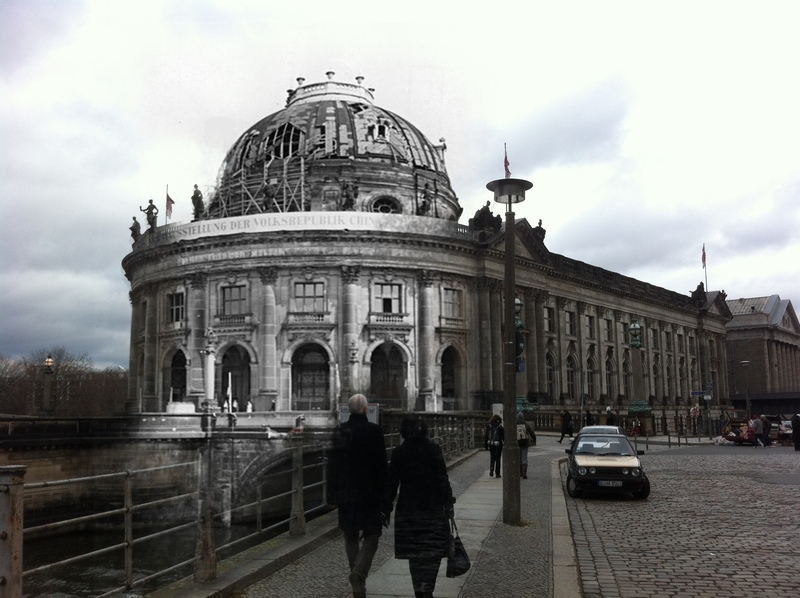 The Red Army lost some 80,000 men taking Berlin and you can see the Reichstag’s damaged dome in the back. 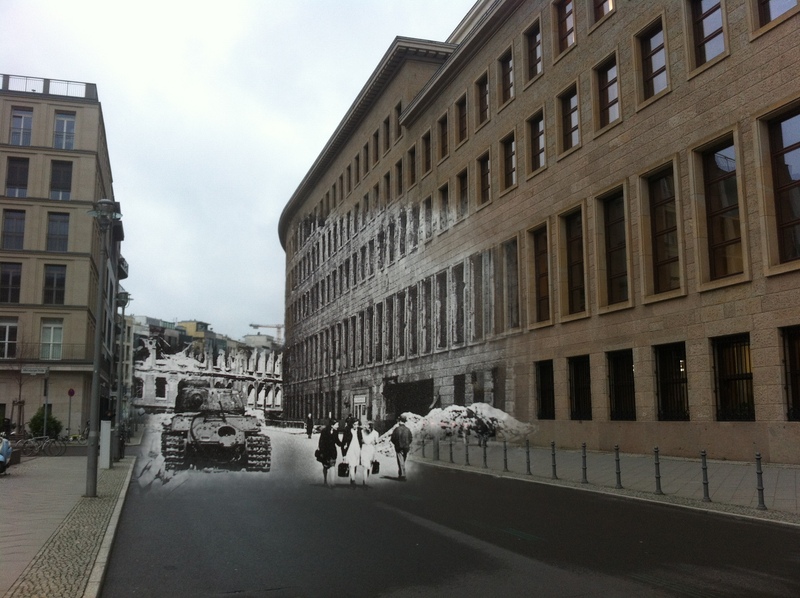 Today this area is full of tress, but after the Battle of Berlin the area had been stripped bare. First by bombs,then later by civilians for firewood. There are many Soviet Memorials in Berlin, one of my favorite being the Soviet Memorial in Treptow. I love this kind of thing! Im glad you like it, I’ve been working on it for nearly two years. Thanks! Your clever transpositioning of eras is intriguing. 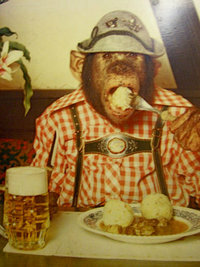 Can’t wait to viist Berlin. Another smashing set of photos. I’m also a fan of the Soviet War Memorial in Treptower Park and I can’t believe how long it took me to actually visit. I’m looking forward to seeing the memorial in Pankow when the renovations are completed. Great combination of old and new Pics! 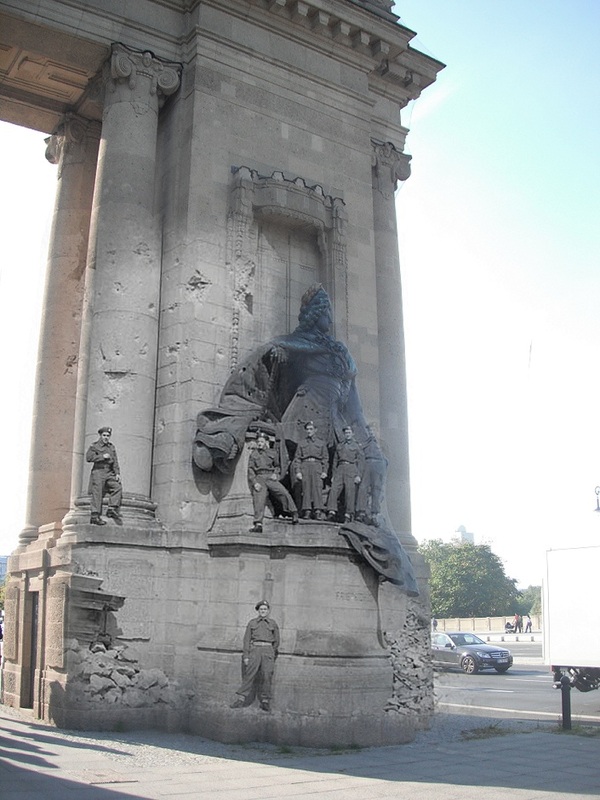 To fill one of your gaps: the guy on the left side of Charlottenburger Tor is Friedrich I. (first King of Prussia). The left side of the gate shows his wife Sophie Charlotte (not on your picture) who gave the district and the castle under her arm the name Charlottenburg.